Largs is an area with vast history; the name 'Largs' is derived from the Gaelic 'learg' meaning grassy slope. 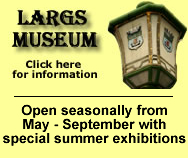 There are many local areas of interest in and around Largs; there is also a small museum open seasonally located in Manse Court (just off Main Street). The museum, operated by the Largs & District Historical Society, also holds the keys to the Skelmorlie Aisle which you can visit on arrangement with the museum. Largs is perhaps most famous for its Viking links - solidified in history by virtue of the Pencil monument (pictured left) and celebrated annually with the Largs Viking Festival which runs in September. Largs is also well known for its connections to Brisbane, Australia. Sir Thomas Brisbane, whom the city Brisbane in Queensland Australia was named after, resided and died in Largs. The word 'Brisbane' is used throughout the town both in the Brisbane Glen, to local businesses such as Brisbane House Hotel and Brisbane Taxis, to the annual festival celebrating the link between the countries which is called the Brisbane Queen Festival and takes place in July each year. If you fancy travelling further afield to explore Scotland and other historical sights why not call on reputable tour guide George Martin who operates Go Go Bus - a private hire bus available for fully customised Scotland tours. 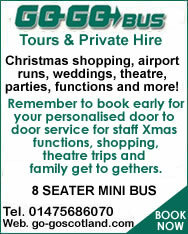 Go Go Bus are also offering special 2007 tours at fantastic prices. Please see the notice on the right for full information. LargsOnline.co.u is designed and maintained by Largs Online, a trading name of Largs Online featuring web design by Laura McAlees and Alistair Archbold. All content © Largs Online 2007 a trading name of Largs Online web design solutions based in Largs Ayrshire Scotland. Pencil image used above left thanks to E Dowds.